Now it's your turn to play along! Just make something inspired by this photo and link it up at the Catch the Bug blog to be in the running for prizes! Very cute with the flowers, that stamp is awesome! Hi Lori wanted to pop over to thank you for your lovely comments, I didn't know I'd won at Bugaboo till I read your comment as I'm away for the weekend, so now my weekend is even better! Love your Kenny K card this week - great colouring! I'm now your newest stalker lol! Great image Lori, just love her oversized shoes!!! Thanks so much for joining us at OCC this week we are pleased to have you. Love this Lori ... isn't she just the funkiest, sassiest looking gal ... your colouring is awesome! Very cute, love the sassy, spunky Kenny K image and the pretty colors. Thank you for joining the "Round and Round" challenge at Phindy's Place. 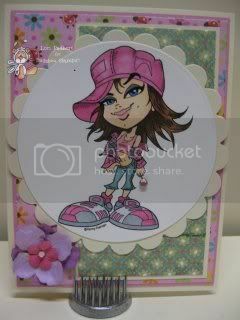 It's a lovely card.Thanks for sharing it with us at ATCs/Cards with Attitude.